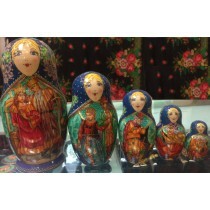 These exclusive Matroushka Dolls were painted by famous Russian artist Gavrilenko Andrey, known all around the world. He’s famous for his Matroushka Dolls painted in exclusive and distinguished Lubok style, also called as “folk picture, popular print, and broadside style”. This Matroushka Dolls set, represented in Russian Treasure shop, and combines both the West-European print features and Russian icon painting traditions. Though the earliest Lubok prints were mostly religious ones, later on the artists varied the subjects of Matroushka Dolls widely. These Matroushka Dolls feature Russian famous fairy tale about Ivan Tsarevich, the Firebird and the Grey Wolf fairytale. The heroes are depicted very laconically, and at the time very vividly. The upper part of every Matroushka Doll is decorated with Russian girl, wearing traditional Russian costume – bright flowered kerchief and ornamented sarafan. Her features are simple and at the same time deep. This Matroushka Dolls set admires the viewer with its bold colors, clear compositions, and decorativeness. Artist’s strokes are firm and masterful. Through the deliberate primitivism, we can see the steady hand of master that knows what he does and does it well. The artistic brilliance of Gavrilenko Andrey was marked and appreciated; nowadays he takes pride of place among Matroushka Dolls’ craftsmen. Today, his works could be found represented on numerous world-famous exhibitions, and in private collections worldwide. 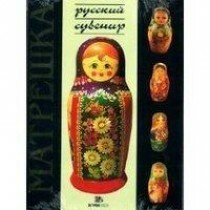 The Matroushka Dolls of Gavrilenko Andrey are illustrated in popular book “Matryoshka. Russian Souvenir”, which features only highly-skilled and worthy artist. Now, you have a really great opportunity to own one of the most precious samples of Russian fine art - Matroushka Dolls, designed and hand-painted by famous Gavrilenko Andrey. These Matroushka Dolls will definitely be pearl of your Russian art collection.